Welcome to the Washington State Attorney General’s Office 2016 Open Government Resource Manual. 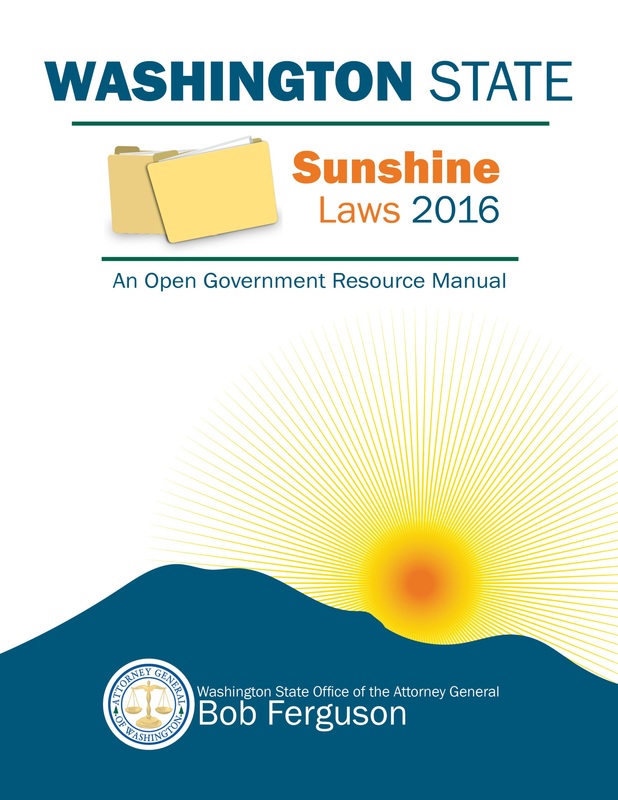 This manual provides you information about our state’s Sunshine Laws. I am committed to enhancing transparency in government. Open government is vital to a free and informed society, and this updated guide will help both public officials and the people they serve understand our state’s open government laws. This 2016 edition modernizes the prior manual interpreting those laws. The manual includes summaries of and links to relevant statutes, court decisions, formal Attorney General Opinions, and Public Records Act Model Rules. My office produced this manual with the assistance of attorneys representing media and requesters, and local and state government organizations. If you have questions or comments about the contents of this manual, please contact Nancy Krier, the Assistant Attorney General for Open Government at nancyk1@atg.wa.gov. My office is a resource for you regarding the state’s Public Records Act and the Open Public Meetings Act. Please explore our website for training and other open government information at /open-government. Thank you for your interest in open, transparent government. The Attorney General’s Open Government Resource Manual describes Washington’s open government laws as of the last update in 2016. The manual was previously updated in 2015. Readers should be aware that court decisions issued or statutes enacted after the last revised date of the manual or a particular chapter may impact the law as summarized here. The manual provides links to cited statutes, cases, Attorney General’s Opinions and rules. More information on open government is available at the Attorney General’s Office Open Government Web page, the Washington Coalition for Open Government, the Municipal Research and Services Center, and other sources. Nancy Krier, Assistant Attorney General for Open Government (Ombuds). Flannary Collins and Bob Meinig (ret. ), Legal Consultants with the Municipal Research and Services Center, which provides legal consultation and other services to Washington local governments. Kristal Wiitala, Information Governance Manager for the Department of Revenue. Ms. Wiitala was previously the Public Records Officer for the Department of Social and Health Services. Katherine George, Attorney at the Harrison-Benis law firm. Ms. George is a former reporter who works with and represents requesters and others on open government cases and issues. If you have any questions or comments about the content of this manual, please contact the Attorney General’s Office Assistant Attorney General for Open Government.